Description: This is a popular bank note but it is not regularly encountered. There are only about two dozen examples known to exist. Prices generally start at about $2,000. Of course rarer varieties in nice condition could be worth a few thousand dollars. Please contact us if you would like an exact value. Varieties: These notes come in varieties based on the payable location. Otherwise there are no design or layout differences. 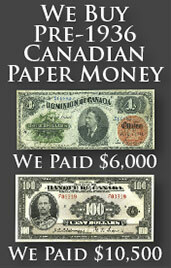 We buy all of these 1866 two dollar bank notes from The Province of Canada. Values are based purely on condition and the issuing location. If you would like our offer, then please send us pictures of your bank note. We will grade the paper money and respond back quickly with our buy and sell price. 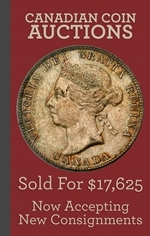 You might be surprised at how much money some notes from The Province of Canada can be worth.